Slowing productivity growth in major economies amid seemingly booming technology presents aparadox. Income inequality has been rising at the same time. Is there a nexus between technology, productivity, and distribution that explains these trends? Indeed so. Slowing productivity and rising inequality have important common drivers, with technological change and its interaction with market and policy failures playing a major cross-cutting role. The agenda to boost productivity and improve equity, often seen in terms of a trade-off, is positively interconnected in significant ways. It will require much innovation in policies to respond to the profound ways in which digital technologies are reshaping markets and work. This paper intends to address these questions, through the analysis of recent and ongoing research. These questions are rich in import and of considerable topical interest. Unsurprisingly, they have spawned much analytical investigation and policy discussion. The aim of this short paper is to provide an overview of the key issues and findings, and demonstrate how they are reshaping policy agenda. The last two-plus decades have been marked by a boom in digital technologies— advances in computer systems, mobile devices, communication platforms, robotics, and much more. How significant are these new technologies–in terms of their potential to boost productivity and economic growth? The answer is intensely debatable. At one end, we find the “techno-pessimists”: those who believe that today’s technological advancements are inherently less consequential than their predecessors and simply cannot bring the kind of economy-wide productivity and growth benefits that were brought by past technological breakthroughs, such as the internal combustion engine and electrification.2 The pessimists also believe that most of the ‘fruit’ from these digital innovations was plucked back when they were first introduced, and subsequent advancements have predominantly been incremental. At the other end of the debate, we find “techno-optimists”: those who believe digital technologies are transformative, and do have potential to drive rapid productivity growth ––their benefits are merely subject to lags; they come in waves.3 Even if the advantages of the first wave of digital innovations are considered to have already been realized, the optimists deduce that productivity could continue benefiting from the next waves—such as radical increases in mobility from smartphones, cloud computing, 3D printing, artificial intelligence, and the Internet Of Things. New technologies are contributing to increased market concentration by altering the structure of competition in ways that produce “winner-takes-most” outcomes. Analysis of the productivity dynamics at the firm level provides further important insights. Productivity growth has generally slowed down ––except in the leading technological firms. Gains have decelerated considerably in the vast majority of other, typically smaller firms, pulling the aggregate productivity rate lower. 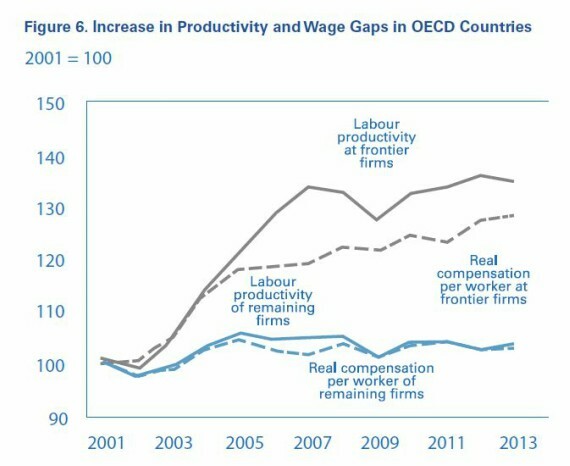 In Figure 2, a clear pattern of increasing inter-firm productivity divergence can be seen for the OECD economies. The slowdown in productivity growth and the rise in inequality are interconnected. The implication of this pattern can be summed up by the following: the problem may not be the technology itself, but rather its lack of penetration. It is not so much that innovation has weakened greatly (as feared by techno-pessimists), but that barriers are limiting productivity gains and preventing a broader diffusion of innovations across firms –a finding that is more akin to the views of techno-adaptationists. The widening gaps in productivity performance between firms go some way in explaining the paradox of slowing aggregate productivity growth amid advancing technology. One view on the productivity paradox that has gained some traction is the notion that it may be illusory. Productivity is underestimated ––the argument states–– because statistics fail to fully capture the true extent of the gains from the new technologies. The statistical data disregard the improvements in product quality, variety, and provision of goods and services that are proven valuable to consumers but do not carry a market price (such as Google searches). However, research finds that although gains from new technologies are indeed underestimated, this mismeasurement can only explain a relatively small part of the slowdown in economic gains6 For the most part, the productivity slowdown, and the ensuing paradox, are real. Concurrently with productivity growth rates decreasing, income inequality has been increasing. Figure 3 shows the trend in the distribution of disposable income (post taxes and transfers) in the G7 economies. 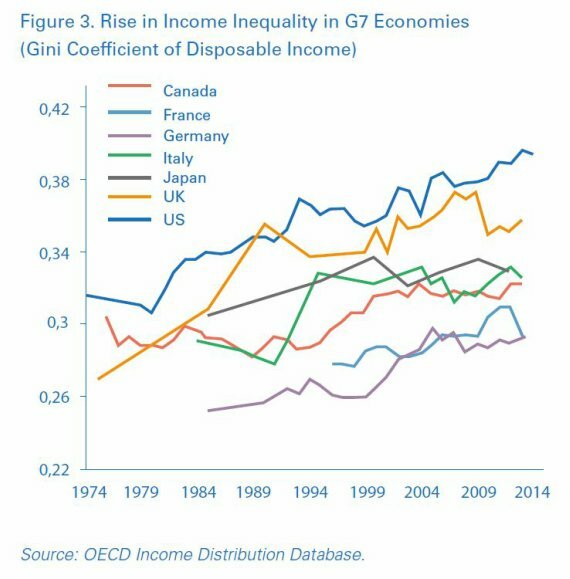 Inequality has risen in every single G7 economy since the 1980s. In many cases, inequality has risen particularly sharply at the top end of the income distribution. Again, while Figure 3 covers the G7 economies, the trend of rising inequality applies more broadly to advanced economies. The data are more varied in emerging economies, but many emerging economies also witnessed a rise in inequality over the same period. The concurrence of the slowdown in productivity growth and the rise in income inequality is vividly illustrated by the case of the United States. Labor productivity in the decade up to 2015 averaged less than half the growth rate of the midto late-1990s. Over the same period, income inequality, as measured by the broadest measure of inequality (the Gini coefficient), increased by more than 10 percent. The income share of the richest 1 percent has more than doubled since the early 1980s (to around 22 percent), with more than half of that increase occurring since the mid-1990s. Barriers to a broader diffusion of the new technologies are producing outcomes that are both inefficient and unequal. The mix of technological changes and market conditions as influenced by policies has been a vital cross-cutting factor, affecting the evolution of both productivity and income inequality. Technology, productivity, and distribution have been linked by a common nexus. Technology is altering the economic setting in significant ways. 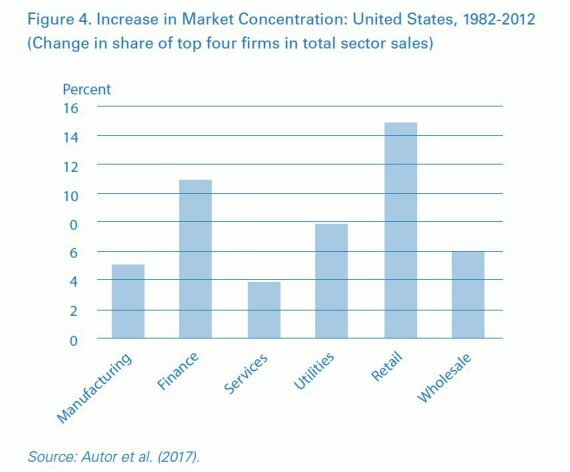 At its root, the productivity slowdown appears to reflect a growing inequality in productivity performance between leading firms and their smaller competitors. The benefits of new technologies have been captured, for the most part, by a relatively small number of larger firms. Aggregate productivity growth is slower in industries with wider inter-firm divergence in productivity. Barriers to a broader diffusion of the new technologies are producing outcomes that are both inefficient and unequal. 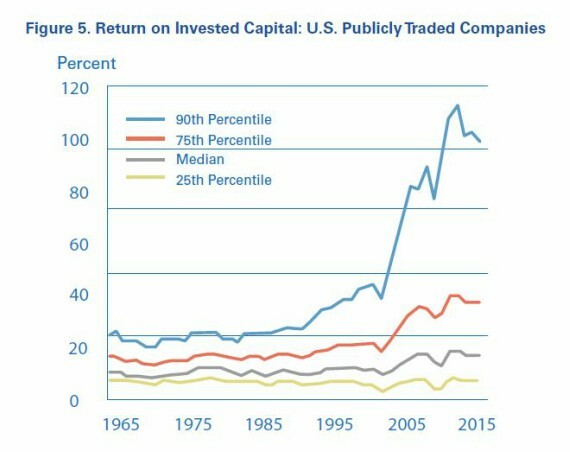 Several factors contributed to the degradation of competition: flaws in the patent system (which acted as a barrier to the diffusion of new technology), regulations restricting competition, increased number of mergers and acquisitions (M&As) coupled with lax anti-trust enforcement, deregulation unsupported by competition safeguards, increased rent-seeking, and firm behaviors showing increased adeptness in erecting barriers to entry (through product differentiation and other means). In addition to failures in policies regarding market competition, new technologies are contributing to increased market concentration by altering the structure of competition in ways that produce “winner-takes-most” outcomes. Digital technologies, in particular, offer scale economies and network effects that encourage the rise of dominant firms—and globalization reinforces the scale economies by facilitating access to markets worldwide. The “winner-takes-most” dynamic has been particulary evident in high-tech sectors, as reflected in the rise of “superstar” firms such as Facebook and Google. Increasingly, however, it is affecting broader segments of the economy as digital applications penetrate business processes in other sectors, ranging from transportation and communications to finance and retail. 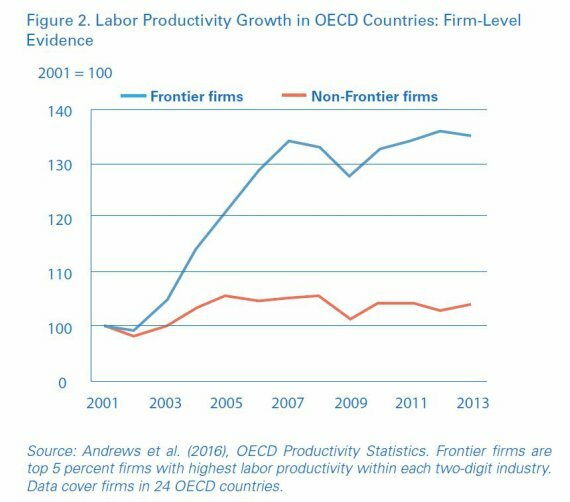 While workers employed in firms at the technological frontier earned more than did those in other firms, gains from higher productivity at these firms were shared unevenly, with wage growth lagging productivity growth. Wages rose in the better-performing firms, but at a lesser rate than the rise in productivity. For most other firms, limited wage growth reflected limited productivity growth, although even at these firms wage growth tended to fall short of the meager gains in productivity (Figure 6). 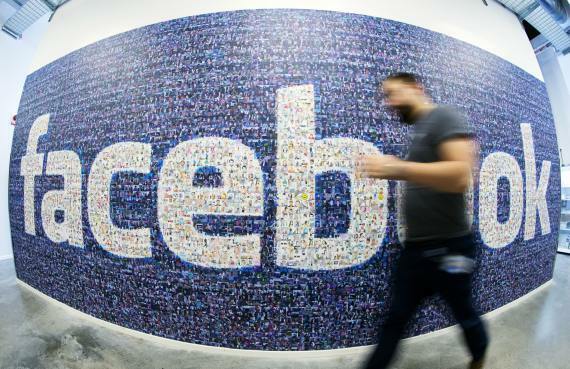 A man walks past a wall sized logo created from pictures of Facebook users in the company’s Data Center in Swedish Lapland. Facebook continues to enjoy remarkable success and is expanding into new areas such as artificial intelligence. Digital technologies and automation have shifted the demand for labor toward higher-level technical and managerial skills. In particular, demand has shifted away from routine, middle-level skills that are more vulnerable to automation – jobs such as bookkeeping, clerical work, and repetitive production. 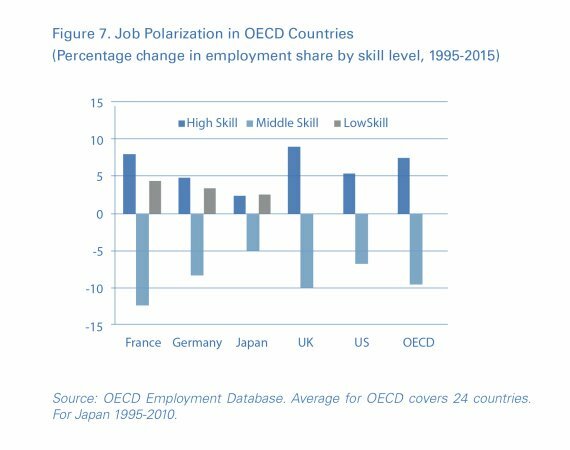 Job markets have seen an increasing polarization; the employment share of middle-skill jobs is falling, while that of higher-skill jobs, such as technical professionals and managers, is rising (Figure 7). The employment share of low-skill jobs has also increased, but mainly service jobs that are hard to automate, such as personal care. A concurrent development has been the rise of the “gig economy”, with more workers engaged in non-standard work arrangements, such as temporary or part-time contracts and own-account employment. The supply of skills has been slow to respond to the changing demand. Education and training have been losing the race with technology.19 The paradox of slowing productivity growth in the midst of booming technology is in part explained by shortages of technical and higher-level skills required by the new technologies, which contribute to the lack of their diffusion across economies. Workers with skills complementary with the new technologies have increasingly been clustered in leading firms at the technological frontier. Across industries, skill mismatches have increased: in OECD countries, on average, around one-quarter of workers report a mismatch between their skills and those required by the job.20 The relative scarcity of higher-level skills has increased skill premia and wage differentials, stoking income inequality.21. While the rise of non-standard work arrangements imparted more flexibility to the labor market, it probably also contributed to increased earnings inequality, as non-standard jobs (especially at lower skill levels) typically carried lower earnings than standard jobs. To achieve stronger and more inclusive growth, the twin trends of slowing productivity and rising inequality must be reversed. Productivity and equity are often seen in terms of a trade-off in economic debates. Recent research points to important complementarities between the two. The drivers of slowing productivity growth and rising inequality are closely interconnected, creating scope for win-win policies. Inevitably, there are trade-offs, and underlying forces, like technology and globalization, will always produce winners and losers. However, policies can help balance these impacts. The strong linkages between productivity and equity call for an integrated approach to formulating a policy agenda that promotes these goals –an approach that aims to exploit the reform synergies and mitigate the trade-offs. The policy agenda for promoting productivity and equity in large part is not only common, but also dynamic. Technology is altering the economic setting in significant ways; it is changing the rules of competition between firms, the nature of work, and the demand for skills. These changes have profound implications for policy; new, out-of-the-box thinking and an inclusive frame of mind will be required. Competition policy also needs to become more global. Riding the forces of technology and globalization, today’s superstar firms are typically multinationals. Similar to the progress the OECD countries have made in strengthening cross-border tax processes to prevent companies from avoiding taxes through profit shifting, there is a need to strengthen international cooperation to address cross-border business practices that restrict competition. A second area of focus should be the reform of technology policies, in order to spur innovation and promote its spread across more economies. Intellectual property regimes need to be better balanced so that they reward innovation but also foster wider economic impacts. There is evidence suggesting that stronger patent protection may be associated with greater market concentration, less follow-on innovation and diffusion, and wider productivity gaps within industries.24 Some have even called for a complete abolition of the patent system.25 Abolishing patents may seem too radical a step, but a fundamental review of the patent system seems warranted to reform overly-broad and stringent protections and give freer rein to competition that ultimately is the primary driver of innovations and their economy-wide penetration. Public investment in research and development (R&D), which has declined in many major economies under fiscal pressures, needs to be bolstered. Public R&D in basic research complements private applied R&D. Many breakthrough innovations developed commercially by the private sector had their origin in government-supported research.26 Public research programs should pay particular attention to ensuring broad access to the fruits of direct public R&D investment, as well as access on a level footing by firms to any private R&D incentives provided through tax relief and grants. Governments could also explore ways of better recouping some of their investment in research to help replenish their R&D budgets. Creating a new balance of shared risks and rewards in public research investment would be in direct contrast to the current paradigm, in which risks are socialized, but rewards are privatized. The third area of improvement concerns investment in skills. Advances in digitization, robotics, and artificial intelligence have led some to draw up dire scenarios of massive job losses from automation, such as half or more of the jobs in OECD economies being at risk.27 Estimating the number of jobs that will be lost to automation may be the wrong focus though, as it only considers the destruction of existing jobs and ignores the creation of new jobs. As we learn from past major episodes of automation, when a technological change made old jobs redundant, it created new ones complementary with the new technologies.28 The main issue is that the nature of work is changing, and the main challenge lies in equipping workers with the higher-level skills demanded by the new technologies and supporting them during the adjustment process. Digital technologies encourage the rise of dominant firms. A fourth area, is revamping labor market policies and social protection. Labor market institutions and social protection arrangements need to adapt to a changing world of work; a new model characterized by more frequent shifts between jobs and more people working independently. Labor market reforms should have a forward-looking orientation to support workers through insurance mechanisms and active labor market policies, facilitating their transition to new jobs. Advanced economies, in general, need to do more and better on forward looking policies.. Reform of backward-looking policies, such as the reform of stringent job protection laws currently underway in France, has particular relevance for European economies. Social contracts, traditionally based on long-term formal employer-employee relationships, will need to be overhauled, with benefits such as health and retirement made more portable and more universally-applicable to accommodate different types of work arrangements. There is currently an active debate on the options to reform social security systems. Proposals range from mechanisms such as a universal basic income (currently being piloted by some administrations),30 to various types of portable social security accounts that could pool workers’ social benefits. Just this year, France launched a portable “personal activity account”, which accumulates workers’ training rights acquired in different types of work. Learning from this debate and experimentation should help inform and guide policy. Technology is a prime driver of productivity and, in turn, long-term economic growth and rise in living standards. Technological change is inevitably disruptive and, indeed, achieves its positive outcomes through what Schumpeter termed “creative destruction”. How new technologies translate into actual increases in productivity depends greatly on how these impacts and processes are managed through policies. Technology also significantly affects how the rewards of growth are shared, but again the actual distributional impacts depend on how policies respond. Advancements in digital technologies hold much promise. Their potential to deliver productivity growth has not been fully tapped –in fact, the rate of productivity growth has decreased, while income inequality has increased. Much of recent political discourse has been focused on international trade, identifying it as the culprit to blame for higher unemployment rates, pay cuts for less skilled workers, and increased inequality. However, evidence indicates that the more influential factor has been technological change. A common set of factors— linked to the nature of the new technologies and how they have interacted with policy failures—has dampened productivity growth and exacerbated inequality. As sketched out in this paper, there is an integrated narrative that explains the interconnected nature of these trends. To achieve better outcomes on productivity and equity, policies need to rise to the challenges of the digital age. A better tomorrow can be created by revitalizing competition, spurring innovation at the technological frontier (while also promoting its broad diffusion across economies), upskilling and reskilling workers, and reforming social contracts. Policymaking will need to be responsive to a context of significant and continuing change. The challenges are enormous, and the political economy of reform is difficult. But, fortunately, the policy options are not limited to a binary choice between productivity and equity. There are policies that can promote both. Policymakers should approach them through an integrated agenda of reforms. Acemoglu, Daron, and Pascual Restrepo (2016). “The Race between Machine and Man: Implications of Technology for Growth, Factor Shares and Employment,” NBER Working Paper Series, No. 22252, National Bureau of Economic Research, Cambridge, MA. Adalet McGowan, Muge, and Dan Andrews (2015). “Labor Market Mismatch and Labor Productivity: Evidence from PIAAC Data.” Economics Department Working Paper, No. 1029. OECD Publishing, Paris. Andrews, Dan, Chiara Criscuolo, and Peter Gal (2016). “The Best Versus The Rest: The Global Productivity Slowdown, Divergence Across Firms and the Role of Public Policy,” OECD Productivity Working Paper, No. 5, OECD Publishing, Paris. Autor, David, David Dorn, Lawrence Katz, Christina Patterson, and John Van Reenen (2017). “The Fall of the Labor Share and the Rise of Superstar Firms,” NBER Working Paper Series, No. 23396, National Bureau of Economic Research, Cambridge, MA. Autor, David (2014). “Skills, Education, and the Rise of Earnings Inequality among the “Other 99 Percent”,” Science, 344 (6186): 843-851. Baily, Martin, and Nicholas Montalbano (2016). “Why is U.S. Productivity Growth So Slow? Possible Explanations and Policy Responses,” Hutchins Center Working Paper, No. 22, The Brookings Institution, Washington DC. Boldrin, Michele, and David Levine (2013). “The Case Against Patents,” Journal of Economic Perspectives, 27 (1): 3-22. Byrne, David, John Fernald, and Marshall Reinsdorf (2016). “Does the United States Have a Productivity Slowdown or a Measurement Problem?” Brookings Papers on Economic Activity, Spring 2016: 109-182. Brynjolfsson, Erik, and Andrew McAfee (2011). Race Against the Machine: How the Digital Revolution Is Accelerating Innovation, Driving Productivity, and Irreversibly Transforming Employment and the Economy, Digital Frontier Press, Lexington, MA. CEA (Council of Economic Advisers) (2016). “Labor Market Monopsony: Trends, Consequences, and Policy Responses,” The White House, Washington DC. Cette, Gilbert, Jimmy Lopez, and Jacques Mairesse (2016). “Market Regulations, Prices, and Productivity,” American Economic Review, 106 (5): 104-08. Cowen, Tyler (2011). The Great Stagnation: How America Ate All the Low-Hanging Fruit of Modern History, Got Sick, and Will (Eventually) Feel Better, Dutton, New York, NY. Decker, Ryan, John Haltiwanger, Ron Jarmin, and Javier Miranda (2017). “Declining Business Dynamism, Allocative Efficiency, and the Productivity Slowdown,” American Economic Review, 107 (5): 322-26. Derviș, Kemal, and Zia Qureshi (2016). “The Productivity Slump – Fact or Fiction: The Measurement Debate,” Policy Brief, August 2016, The Brookings Institution, Washington DC. Égert, Balázs (2017). “Regulation, Institutions and Aggregate Investment: New Evidence from OECD Countries,” Economics Department Working Paper, No. 1392, OECD Publishing, Paris. Frey, Carl, and Michael Osborne (2013). The Future of Employment: How Susceptible Are Jobs to Computerization? Oxford Martin School, Oxford, UK. Furman, Jason, and Peter Orszag (2015). “A Firm-Level Perspective on the Role of Rents in the Rise in Inequality,” Presentation at “A Just Society” Centennial Event in Honor of Joseph Stiglitz, Columbia University, New York, NY. Goldin, Claudia, and Lawrence Katz (2008). The Race between Education and Technology, Harvard University Press, Cambridge, MA. Gordon, Robert (2016). The Rise and Fall of American Growth: The U.S. Standard of Living since the Civil War, Princeton University Press, Princeton, NJ. Gutiérrez, Germán, and Thomas Philippon (2016). nvestment-less Growth: An Empirical Investi gation,NBER Working Paper Series, No. 22897, National Bureau of Economic Research, Cambridge, MA. Hanushek, Eric, Guido Schwerdt, and Simon Wiederhold (2013). “Returns to Skills Around the World: Evidence from PIAAC,” NBER Working Paper Series, No. 19762, National Bureau of Economic Research, Cambridge, MA. IMF (2017). World Economic Outlook, April 2017, Chapter 3 on “Understanding the Downward Trend in Labor Income Shares,” IMF, Washington DC. Krugman, Paul (2015). “Challenging the Oligarchy,” The New York Review of Books, December 17, 2015. Mazzucato, Mariana (2015). The Entrepreneurial State: Debunking Public vs Private Sector Myths, Public Affairs, New York, NY. Mokyr, Joel (2014). “Secular Stagnation? Not in Your Life,” in Coen Teulings and Richard Baldwin (eds. ), Secular Stagnation: Facts, Causes, and Cures, CEPR Press, London, UK. OECD (2017a). “The Great Divergence(s),” OECD Science, Technology and Innovation Policy Papers, No. 3923, OECD Publishing, Paris. OECD (2017b). Economic Policy Reforms 2017: Going for Growth, OECD Publishing, Paris. OECD (2015a). The Future of Productivity, OECD Publishing, Paris. OECD (2015b). “Finance and Inclusive Growth,” OECD Economic Policy Paper, No. 14, OECD Publishing, Paris. Ollivaud, Patrice, Yvan Guillemette, and David Turner (2016). “The Links Between Weak Investment and the Slowdown in Productivity and Potential Output Growth,” Economics Department Working Paper, No. 1304, OECD Publishing, Paris. Philippon, Thomas (2016). “Finance, Productivity, and Distribution,” Paper prepared for Chumir-Brookings project on the Great Policy Challenge, October 2016, The Brookings Institution, Washington DC. Piketty, Thomas (2014). Capital in the Twenty-First Century, Harvard University Press, Cambridge, MA. Qureshi, Zia (2017). “Productive Equity and Why It Matters to the G20,” UpFront, The Brookings Institution, Washington DC. Qureshi, Zia (2016). “The Productivity Outlook: Pessimists Versus Optimists,” Policy Brief, August 2016, The Brookings Institution, Washington DC. Schwellnus, Cyrille, Pierre-Alain Pionnier, and Mathilde Pak (forthcoming). “The Structural and Policy Determinants of Wage-Productivity Decoupling: Industry- and Firm-Level Evidence,” Economics Department Working Paper, OECD Publishing, Paris. Song, Jae, David Price, Faith Guvenen, Nicholas Bloom, and Till von Wachter (2015). “Firming Up Inequality,” NBER Working Paper Series, No. 21199, National Bureau of Economic Research, Boston, MA. Stiglitz, Joseph (2016). “Monopoly’s New Era,” Project Syndicate, May 13, 2016. Syverson, Chad (2016). “Challenges to Mismeasurement Explanations for the U.S. Productivity Slowdown,” NBER Working Paper Series, No. 21974, National Bureau of Economic Research, Boston, MA. Turner, Sarah (2017). “Education Markets: Forward-Looking Policy Options,” Hutchins Center Working Paper, No. 27, The Brookings Institution, Washington DC. World Bank (2016). Digital Dividends, World Development Report 2016, The World Bank, Washington, DC. 1 This article draws on, among other work, ongoing research by the author under a project on technological change, productivity, and inequality being undertaken jointly by the Brookings Institution and the Chumir Foundation on Ethics in Leadership. The author would like to acknowledge support from Brookings and the Chumir Foundation. The views expressed in this article, however, are the author’s own. 2 See, for example, Cowen (2011) and Gordon (2016). 3 See, for example, Brynjolfsson and McAfee (2011) and Mokyr (2014). 4 See Qureshi (2016) for an overview of the differing viewpoints in this debate. 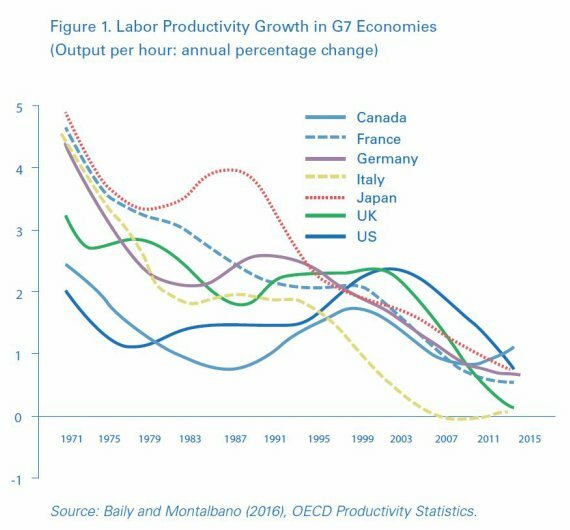 5 While productivity trends are analyzed here in terms of labor productivity, trends based on total factor productivity present a broadly similar picture (OECD 2015a). 6 See Byrne et al. (2016) and Syverson (2016). Derviş and Qureshi (2016) provides an overview of the measurement debate. 7 See OECD (2017a) and Qureshi (2017). 8 See Autor et al. (2017) and Decker et al. (2016). 9 See Andrews et al. (2016) and Cette et al. (2016). 10 See Furman and Orszag (2015) and Stiglitz (2016). 11 See OECD (2015b) and Philippon (2016). 12 See Égert (2017) and Gutiérrez and Philippon (2016). 13 See Ollivaud et al. (2016). 14 See Song et al. (2015). 17 The role of uneven wealth ownership and returns on wealth as sources of inequality has been particularly emphasized by Thomas Piketty in his 2014 bestseller (Piketty 2014). 19 See Goldin and Katz (2008) and Autor (2014). 20 See Adalet McGowan and Andrews (2015). 21 See Hanushek et al. (2013) and Autor (2014). 24 See Andrews et al. (2016) and Autor et al. (2017). 25 See Boldrin and Levine (2013). 26 Recent examples often mentioned in this context are the Internet, Google’s basic research algorithm, and key features of Apple smartphones (Mazzucato 2015). 27 See Frey and Osborne (2013) and World Bank (2016). 28 See Acemoglu and Restrepo (2016). 29 In the United States, for example, college enrollment and completion gaps by family income level have increased over the past few decades (Turner 2017). 30 For example, there is currently a two-year pilot in Finland and one in Ontario, Canada. Qureshi, Zia. "Advanced Tech, but Growth Slow and Unequal: Paradoxes and Policies." In The Age of Perplexity. Rethinking The World we knew. Madrid: BBVA, 2017.